I took on the ownership of UE 6832 (William to his friends) my 1928'ish. Chummy in January, 2004. He had been extensively re-built by John Hearne in Flitwick, Bedfordshire in 2002. Now why, on the threshold of three score years and ten (me, not the car) would a normally sane person dash off up country and buy a car seven years older than himself and particularly an Austin Seven? My first mechanical transport was an autocycle purchased at Watford market for the princely sum of £3 in 1950 when I was still at school. This was followed by a 98 cc Corgi, also known as the Welbike, built by Brockhouse Engineering and I believe also used by paratroopers as it folded flat. After a spell at sea and National Service in The Royal Air Force I found myself in 1956 as an apprentice at Metropolitan Vickers, Trafford Park, Manchester. I was now splendidly equipped with a 150cc LD Lambretta. Two wheels eventually gave way to four (was there a girl involved?) in the form of a very tatty and chopped about AG, (I think) Tourer. No hood or side screens. Driven dressed in an ex. army gas cape with a large sponge permanently on the lap to absorb excess water as it rained frequently in Manchester. To my young eyes this car rather lacked in charisma and I hungered for something with rather more panache. Then I saw it and fell madly in love. A nicely original 1925 Chummy. At this time these cars were regarded as cheap hack transport for the impecunious and usually changed hands for about £10 or £15. Sevens were a fairly common sight in daily use. Our supervisor ran a very delightful Gordon England Cup Model, the envy of us all. Back to the plot. The lusted after Chummy was owned by a fellow apprentice named Jock Maltman. I cultivated this guy and came rapidly to realise that he was very nervous about the Chummy. He was terrified of the brakes and was unable to master the three speed gate change. Ah ah! me thinks. A quick run in my Tourer demonstrated the superb efficiency of the brakes, the complete ease of the gear changing mechanism and the superiority of the electric wiper in the inclement Mancunian climate. Jock was also the owner of a fine set of waterproofs as he had come to the Chummy via several real motorcycles. Now, when I look back, I am fairly horrified at how pushy I must have been. Covetous too! A deal was done and we made a straight swap plus a full tank of gas in the Tourer. We remained good friends. I loved that car and we had a few adventures up North. Gaining in confidence I headed south to go and visit my parents for a few days. At the time they lived at Rickmansworth in Hertfordshire. Safely arrived I parked my pride and joy on the drive for all to come and admire. My Mother said all the right and nice things, but my Father seemed rather subdued. A couple of days later, having had a run in the Chummy, he took me to one side saying ”My boy I don’t think this is quite the car your Mother and I are happy for you to be driving about in.” Oh!… .sense of total deflation. A couple of days later Pa jumped into his Triumph Roadster and I was told to follow. We ended up at Performance Cars, Chiswick. Having parked the Chummy I was beckoned onto the forecourt, introduced to a salesman and lead to a magnificent 1954 1250 cc TF MG. Reg.No ORU101 a Bournemouth car. I jumped into the passenger seat in a state of dazed confusion. A very racy, pacey demonstration left me feeling that I had boarded a moon rocket by comparison with the Chummy. A deal was done and the Chummy was taken in part exchange for £20. I drove off without a backward glance. Fickle fellow. My Pa had bought me a superb car for which I have been forever grateful. But over the years there had always been a slight tinge of regret and a feeling that I had been less than loyal to the Manchester Chummy and that I simply hadn’t spent enough time with that particular car. So here we are, almost back to the present at last. In 2001/02 I was starting to feel that it would be fun to own a Seven again. My wife, Ann, and I owned a Box in 1963/ 64. 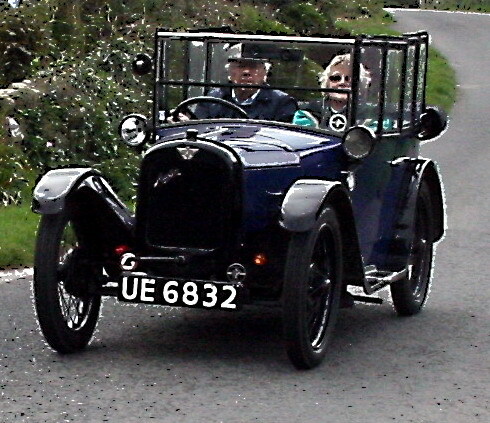 This was used by Ann on the school runs when I had taken our Beetle to work. A club directory in a car magazine provided me with Andrew Jarmin’s address. A phone call resulted in an immediate invite to “come up and see the car”. When I got to Polighey I simply couldn’t believe the Aladdin’s cave of cars and Austinalia almost on my own doorstep. A quick blast as passenger with Andrew in their Chummy brought all the memories flooding back and so a “Chummy hunt“ was on, partly to expunge my long held guilt complex and to hopefully re live an experience prematurely ended some 50 years ago. I always was a late developer. A quick dash to Bedfordshire in the Cavalier to view and gather information. Another trip to Andrew for more advice on all the info. I returned with. A quick run back up country with Andrew’s trailer and a more leisurely return plus Chummy. From this point on life has been marginally taken over by CA7C! My ownership of this car has, I feel, exactly epitomized what CA7C and Austin Seven ownership is all about. William immediately became my daily transport, well almost as I also use a scooter. I wore grooves in the road to Carnkie pestering Andrew about this and that over the next couple of years. He exhibited endless patience and any phone call to him always elicited the response “come up and we’ll see what we can do“. Once the initial euphoria and the challenge of driving the Chummy in modern traffic had slightly diminished I began to feel that the car was embarrassingly slow in certain circumstances. Mainly when reduced to second gear on long hills. We had by this time had the engine and box out to rectify second gear that constantly jumped out of mesh. Box rebuilt the three speed gate change was a delight to use, but gappy and slow. Once in second on any sort of gradient there one stayed for what seemed like an eternity. Often with mirrors full of slavering moderns or grim faced cyclists trying to get past. We usually managed to outflank the older pedestrians. We talked of modifying the engine and finding a four speed box. 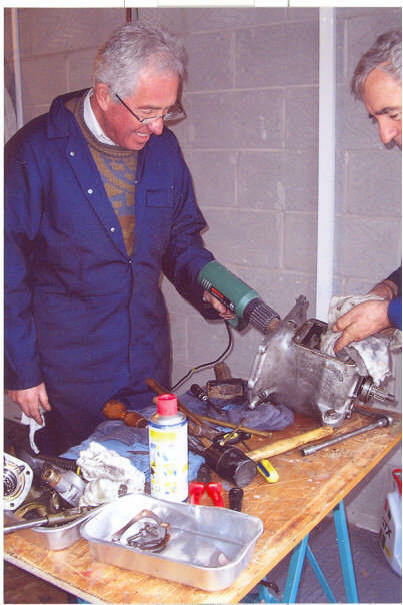 Andrew then heard that another Club member had a later engine and gear box for sale. This was run on the bench at Polighey. All seemed good so with a few tweaks it was popped into the Chummy. In terms of performance this has transformed the car. The higher compression engine, four gears and the faster change have improved all aspects of the way the car goes. One up the car feels surprisingly lively and will storm many hills in top gear. I’m glad to report that only Tour de France grade cyclists now give me any trouble. With a new hood and tonneau the car was now looking good and going well. This happy state of affairs continued until early this year when William became unpleasantly noisy on the overrun. Never the quietest of cars, it has to be admitted, but when working hard the mechanical cacophony was identifiable and acceptable. However, as soon as the throttle was feathered for any reason the noise became mechanically painful. When I mentioned this to my guru he immediately upped sticks and left for some distant land. New Zealand, I think. Can’t say I blame him. I do hope he comes back. I rode my scooter more and drove William less, in the fear that something might let go. At the tail end of January and out of the blue I received a phone call from Malcolm Watts to say that if we were in on Sunday “they” were coming over to sort the car. How could we refuse? Ann laid in the supplies and I set about getting some semblance of order in the garage. The Black Hand Gang duly appeared accompanied by their charming wives. Ladies upstairs (upside down sort of house) to chat, make coffee, and sort lunch. Black Handers to the garage to wage war on poor unsuspecting William. The day was spent making adjustments to the back axle, re lining the rear brakes, having lots of laughs, plenty of good food and generally a merry time. Some of us learnt even more about Sevens. After a brief road test William returned enveloped in a worryingly large cloud of steam. I have to admit that I had neglected to top up the radiator. Road test report; problem not solved and “oh dear me what a dreadful gearbox”. Thursday OK? Yes fine thanks. Thursday comes and on the dot the Black Hand Gang returned. My neighbours were duly impressed by the efficient looking pit crew and the exotic machinery parked outside. Engine out, gearbox on the bench and stripped. Monday… gearbox rebuilt with a selection of parts. Friday… engine and gearbox re united and back in car. A road test confirms that the gearbox is massively improved, the car is quieter but not yet as it should be. The plan now is to run the car for a few weeks to settle things down then replace the carden pin and blocks and have another look at the back axle. So what is the outcome of all this? Well obviously the car gets better and better and confidence improves as one gains more knowledge. To me, as a member of CA7C, even more important is the massive and continuous support that we get from our fellow club members who are prepared to give their time and expertise so generously. It is fun and every one has a good time. It is also an excellent excuse to socialise, other than at organized club outings. Now for all I know you may well be an expert, or maybe not but a time will surely come when a second pair of hands or some moral support would be useful. Don‘t be afraid to ask! 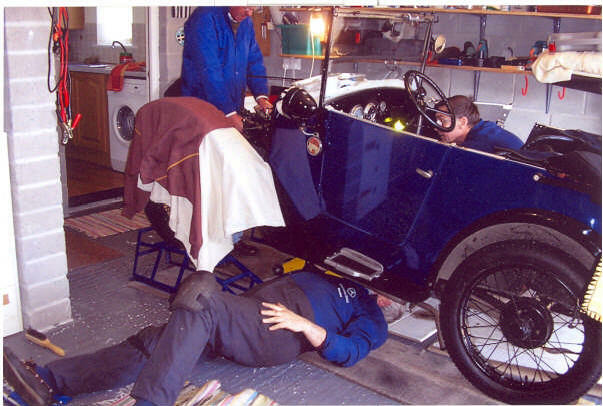 I did recently help as the labourer when we went to sort out another member’s car. I got a great kick out of doing this, I also enjoyed the soup, pasties and very good company. So CA7C……..as in Chummy……..friendly, on good terms, matey. I would most definitely say so. Thanks every one. This article, written by Stephen Lewis, originally appeared in Seven Focus April 2008 pp15-18. Stephen and Ann sold their Chummy to another Club member in March 2016 after enjoying 13 years of Club runs and other events.